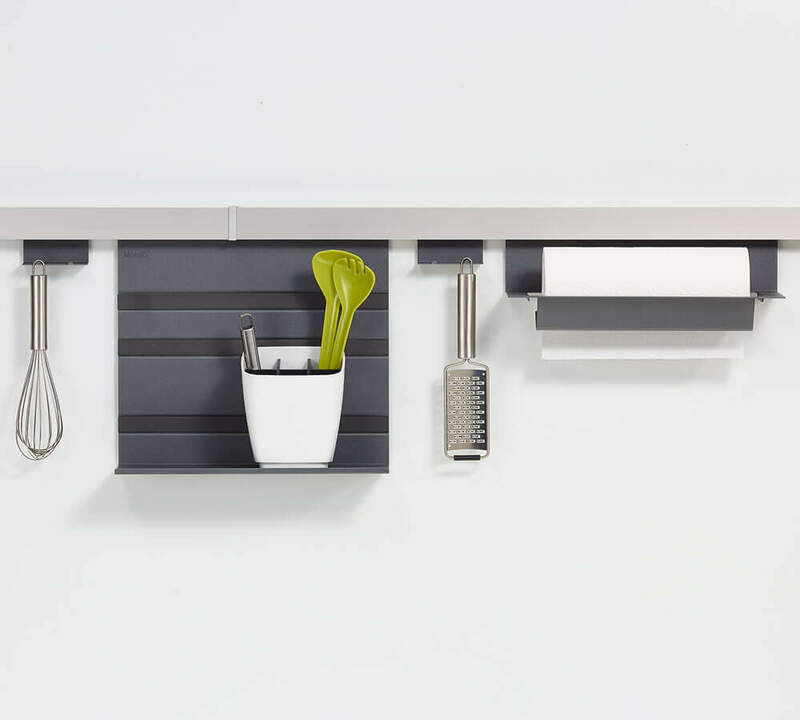 Routine tasks become a real pleasure once your kitchen (or bathroom) is organised the way you like it. 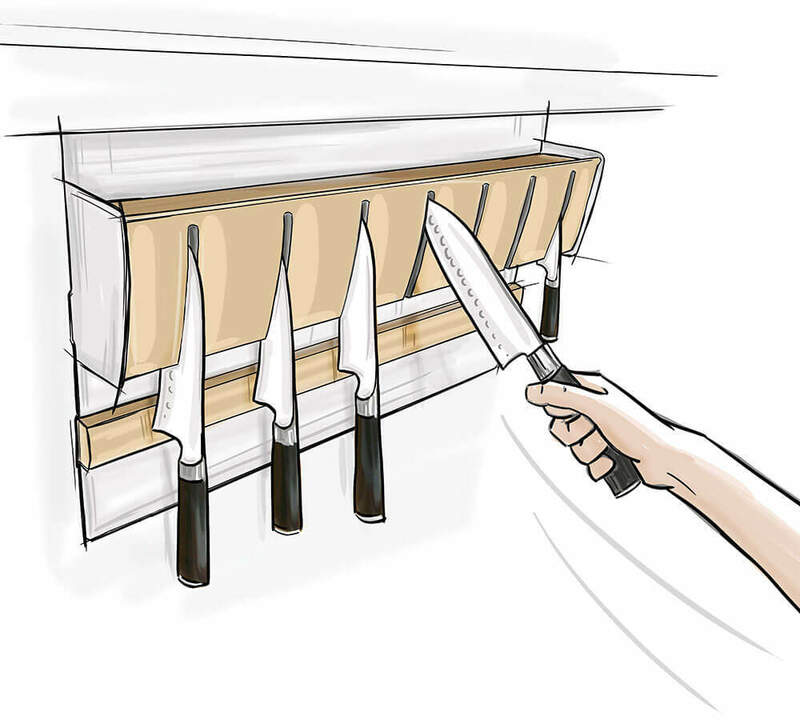 Efficiency means having the things you need often ready to hand. 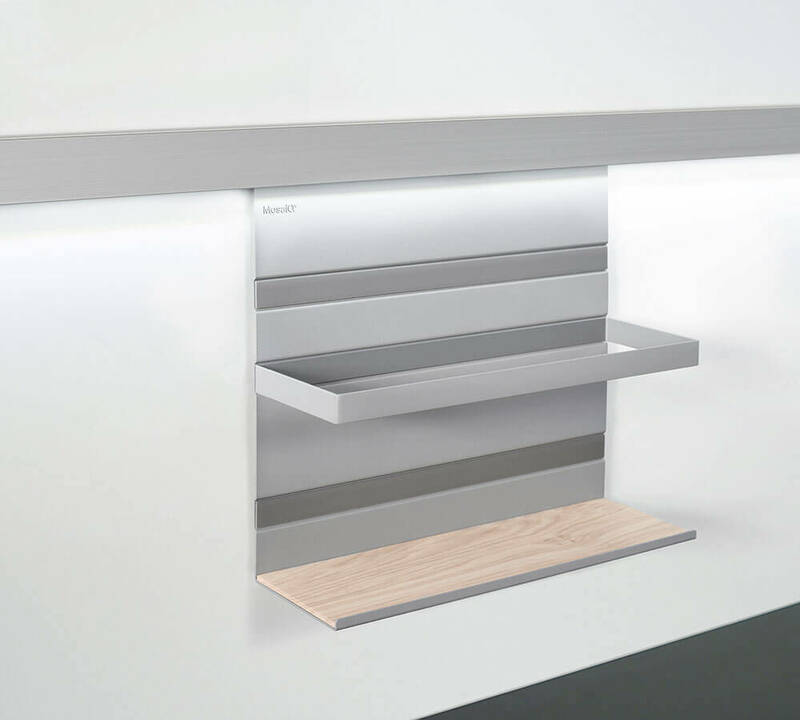 LINERO MosaiQ keeps things where they make sense for your workstyle. 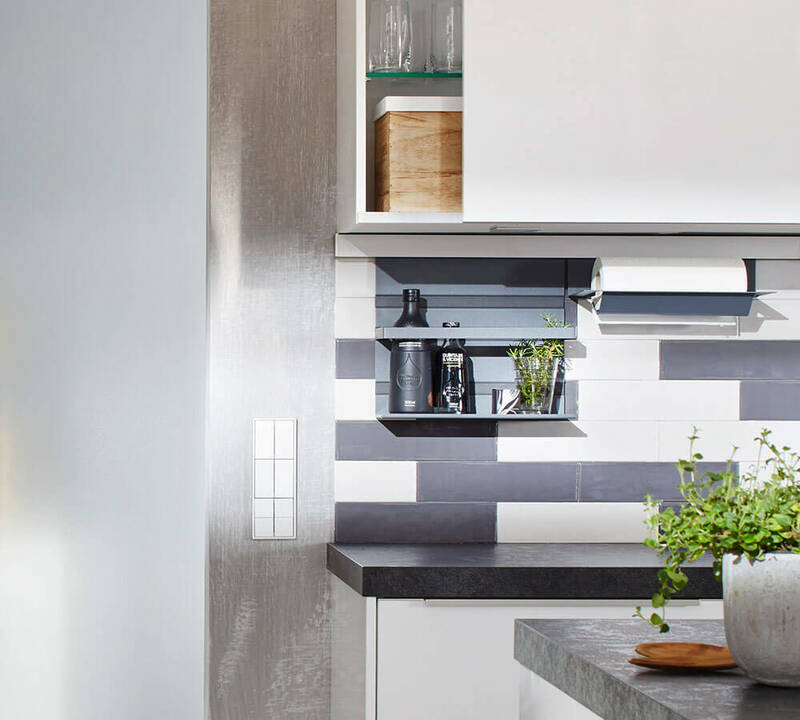 Unlimited options for the splashback area. The basis for this multi-option splashback system is an aluminium rail attached to the wall. 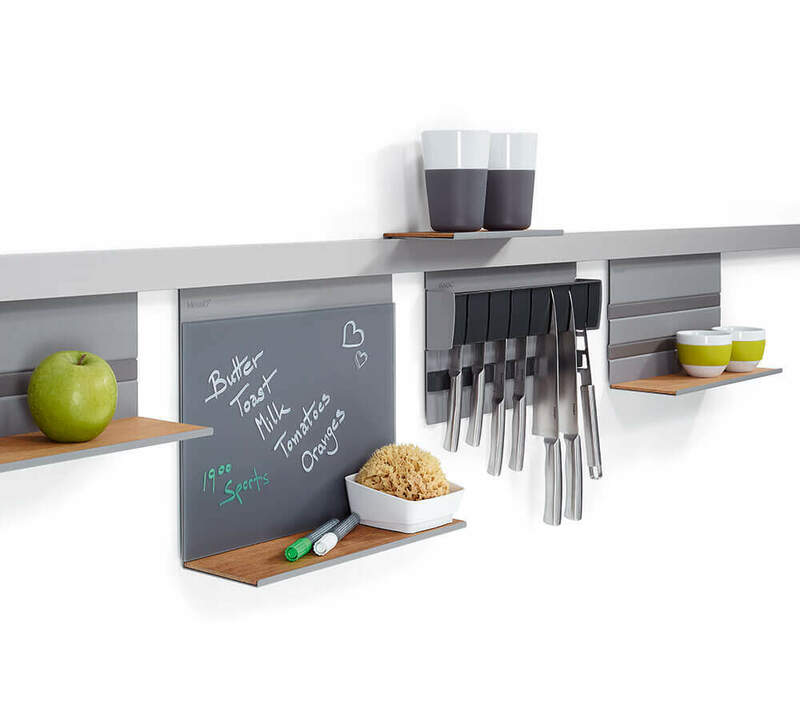 The different storage elements are simply attached above or below the rail, exactly where you want them. 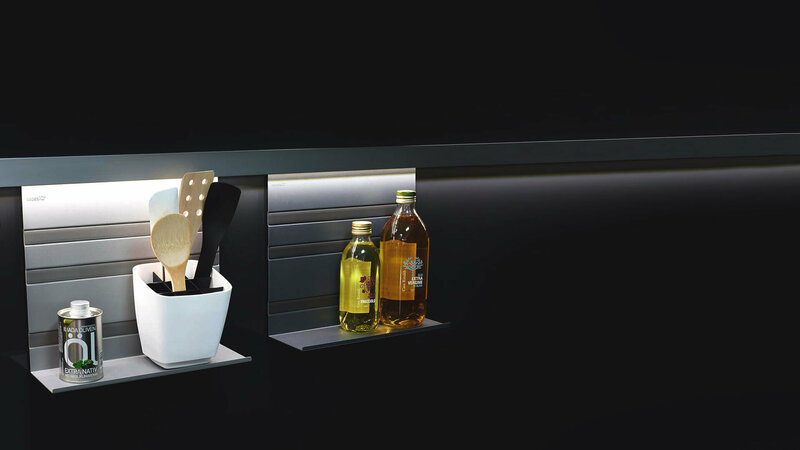 With the integrated lighting strip, all the elements are softly illuminated. Moving elements around couldn’t be easier. 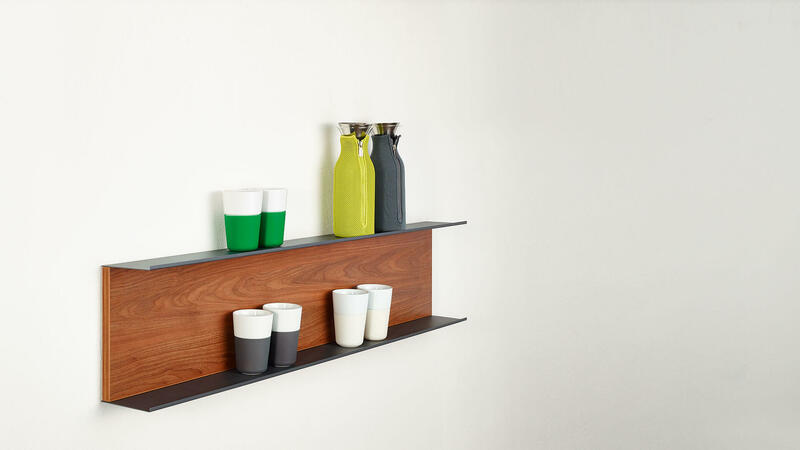 The espresso cups, a pot of basil (or aftershave and a toothbrush) can be stored exactly where you need them – and where they look best. Prop up a tablet computer or anything else you like to keep handy. 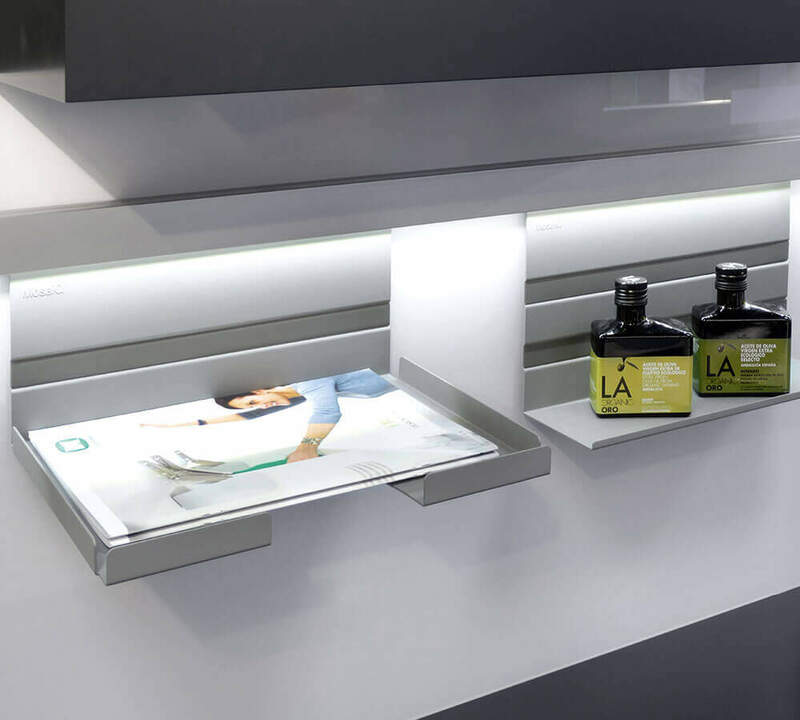 LINERO MosaiQ – special places for everyday things. 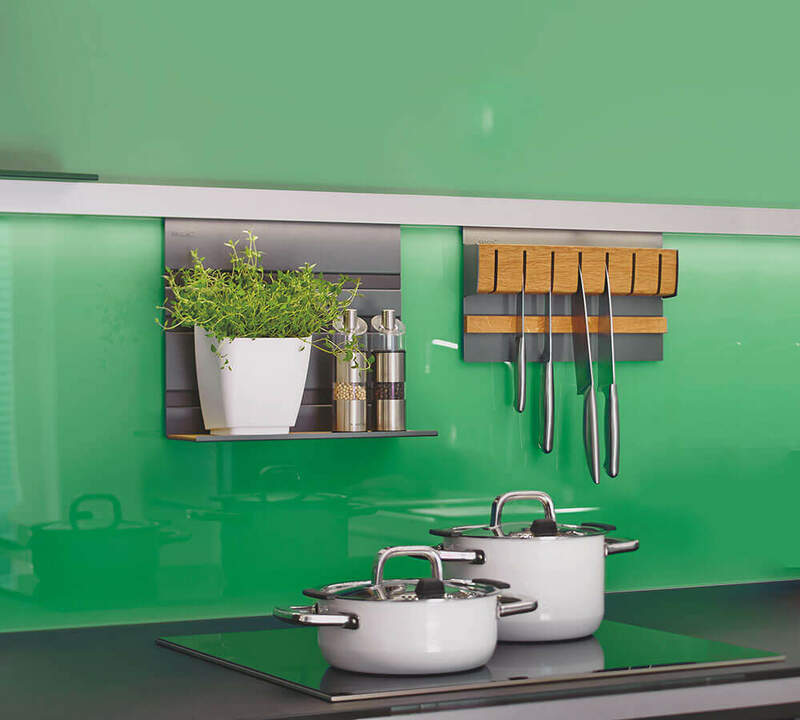 The multi-functional, anodised aluminium rail can be either screwed or glued to the wall, making it ideal for glass splashbacks too. 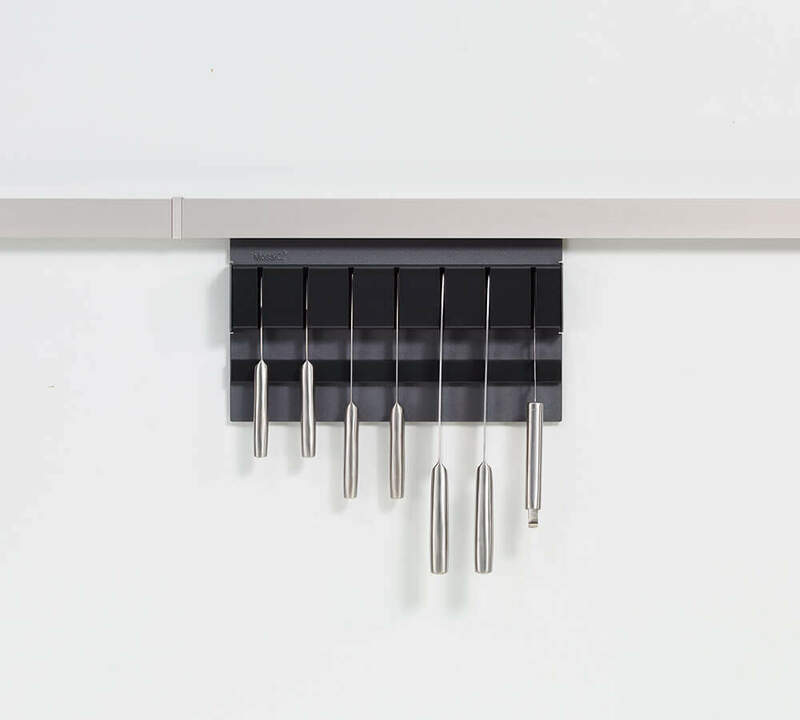 The MosaiQ modules are hung on below or inserted above. 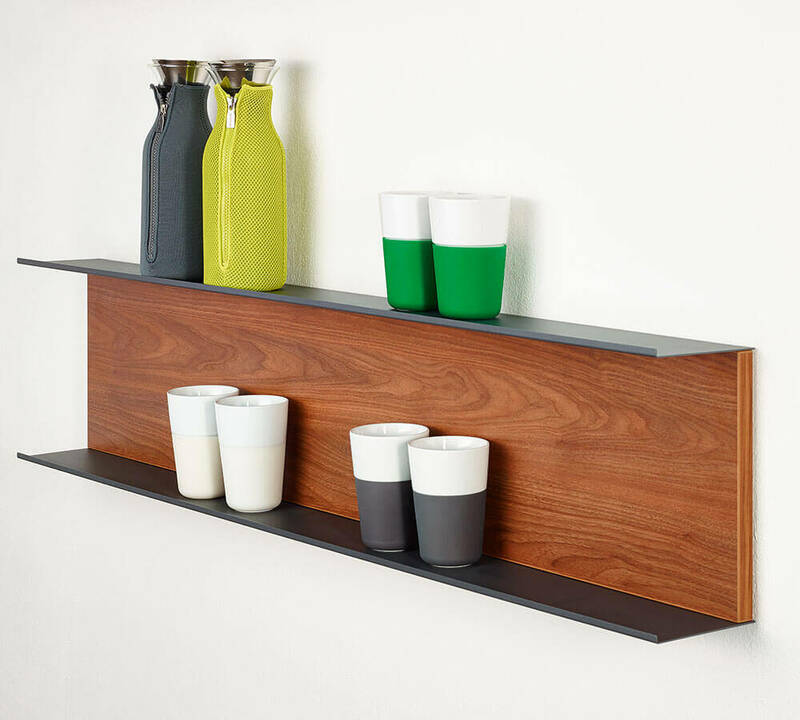 The shelf elements come in a choice of three heights with their design accentuated by horizontal décor strips. 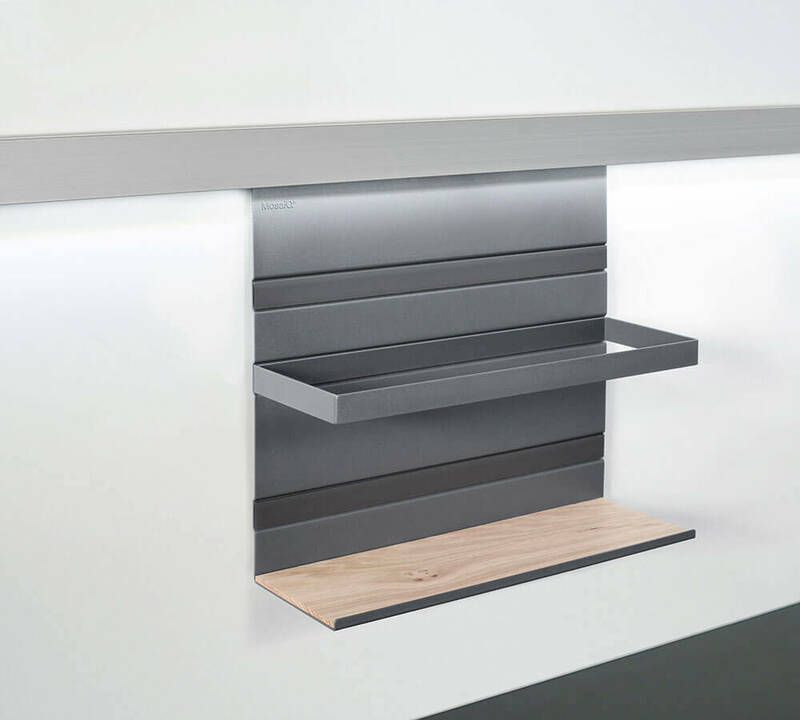 The colour choices of the matt, tactile coating (graphite black and titanium grey) were chosen in consultation with a well-known design institute; shelf inserts come in wood or glass. 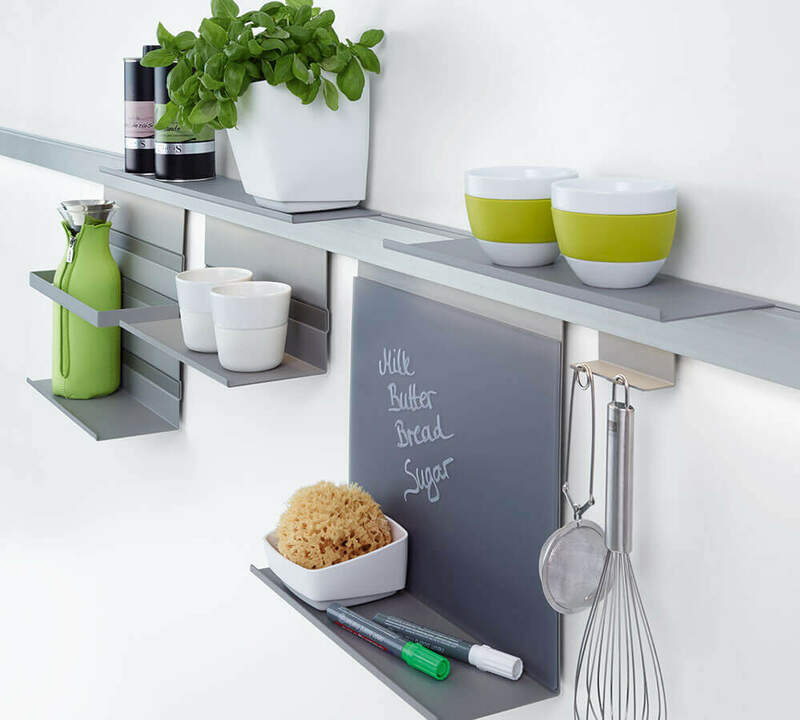 Functional elements include hooks and single and double roll holders. 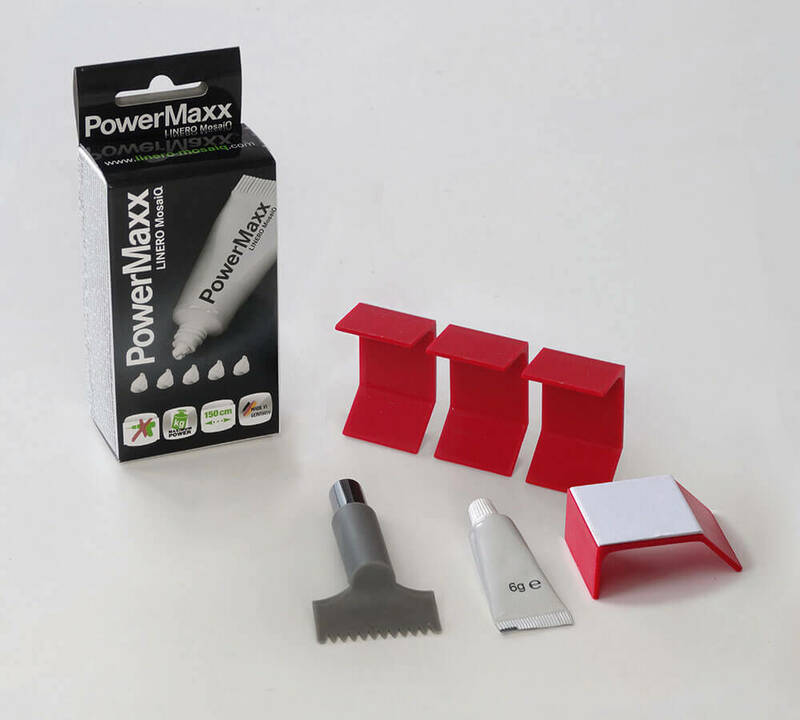 There is also an ergonomically designed knife block and containers with angled bases to hold a pot of herbs or kitchen implements. 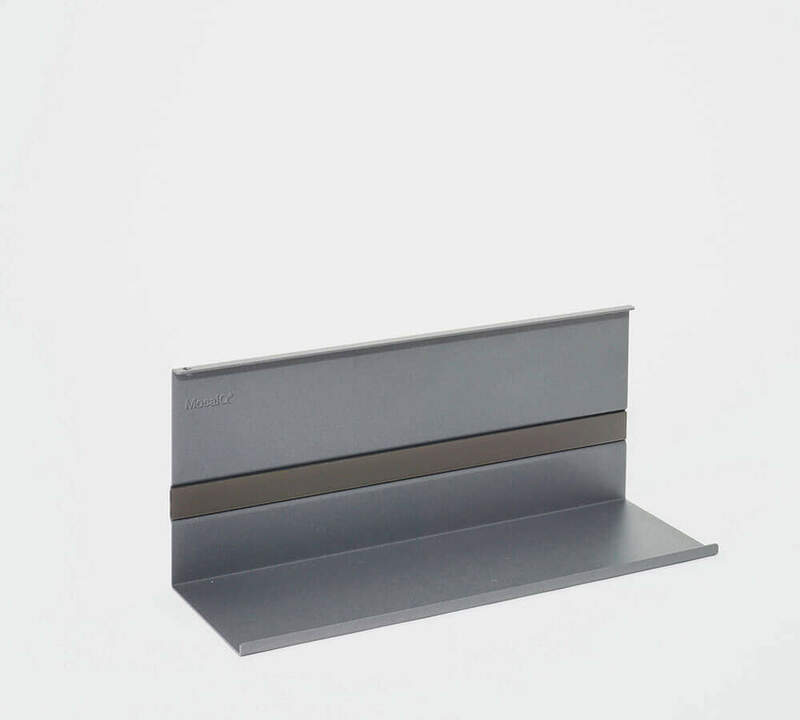 LINERO MosaiQ has been launched with eleven core applications for unlimited mixing and matching. 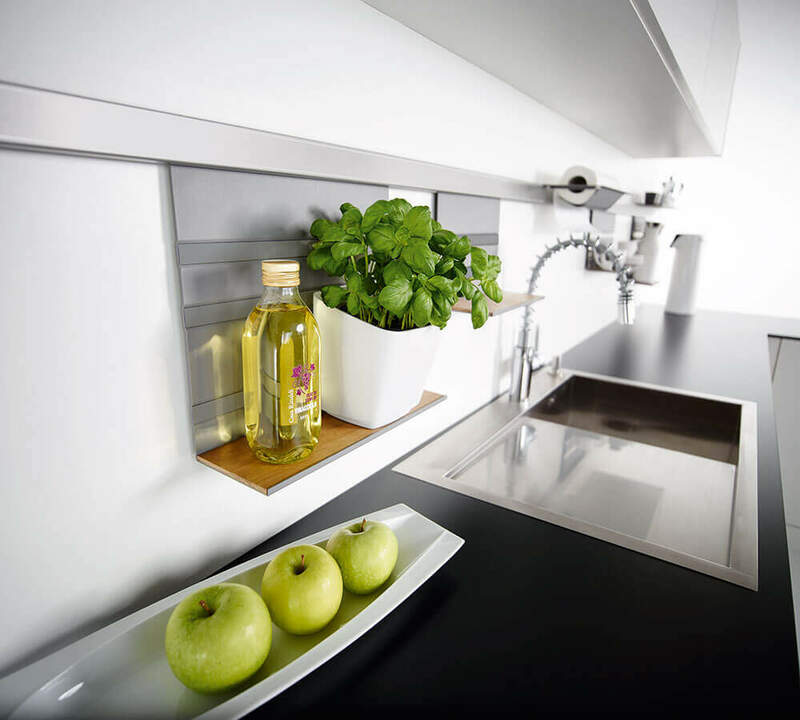 The system lets each user make the most of the splashback space in their kitchen or bathroom. 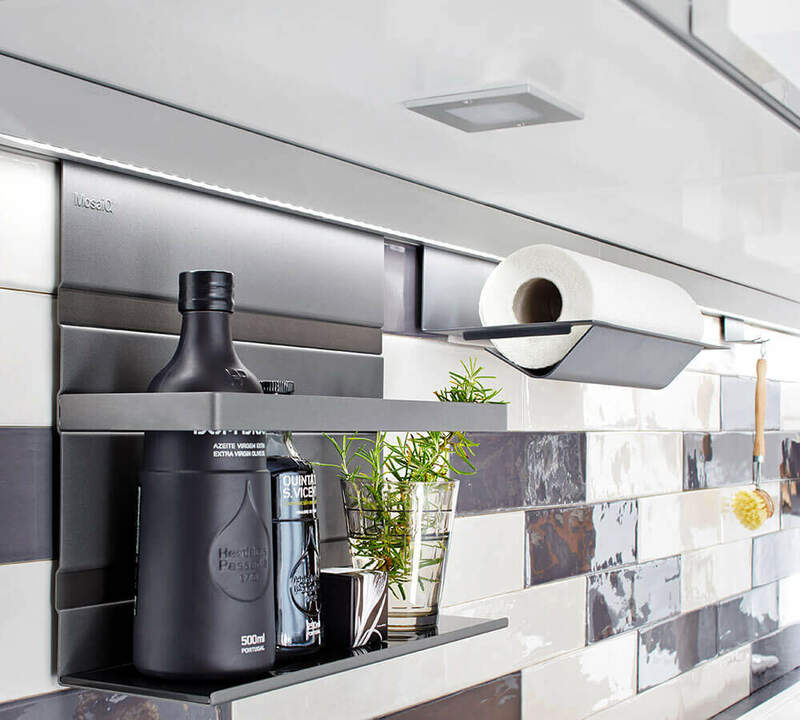 Under-mounted LINERO MosaiQ elements and LINERO 2000 elements are, of course, compatible. Light up your LINERO MosaiQ! 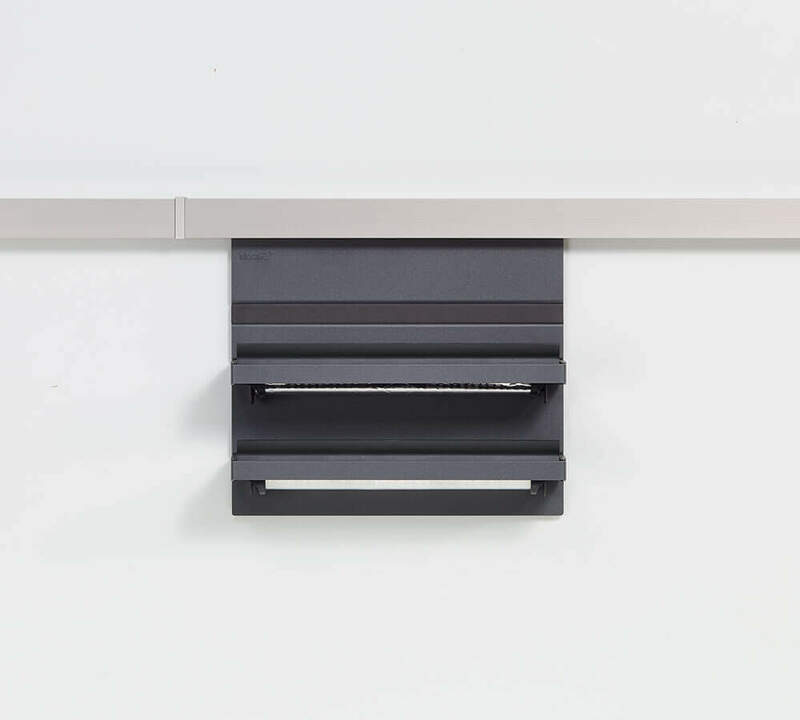 With integrated led light sticks, the multifunctional rail casts a neutral white, indirect light over the MosaiQ elements. 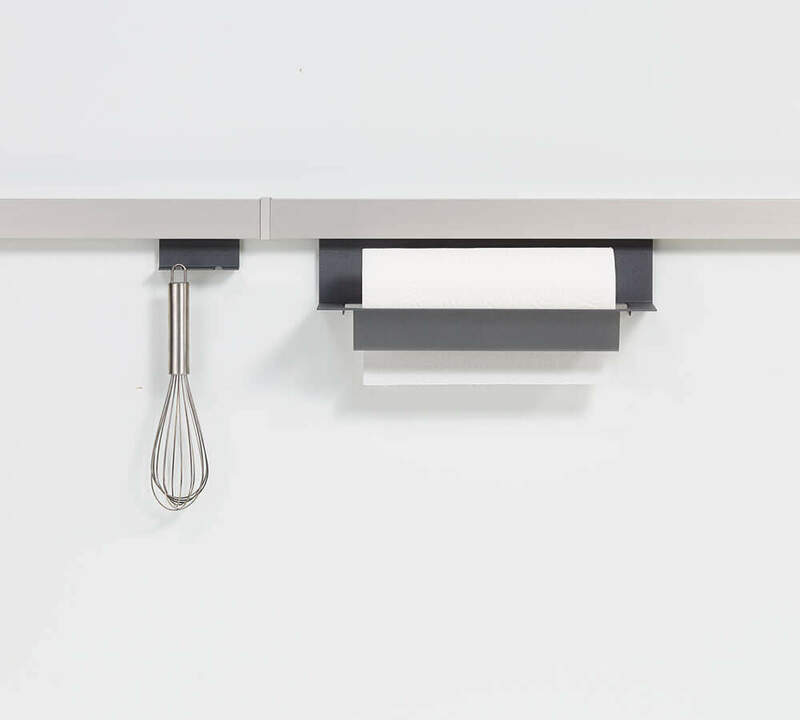 Today’s kitchens have to keep a lot of people happy. 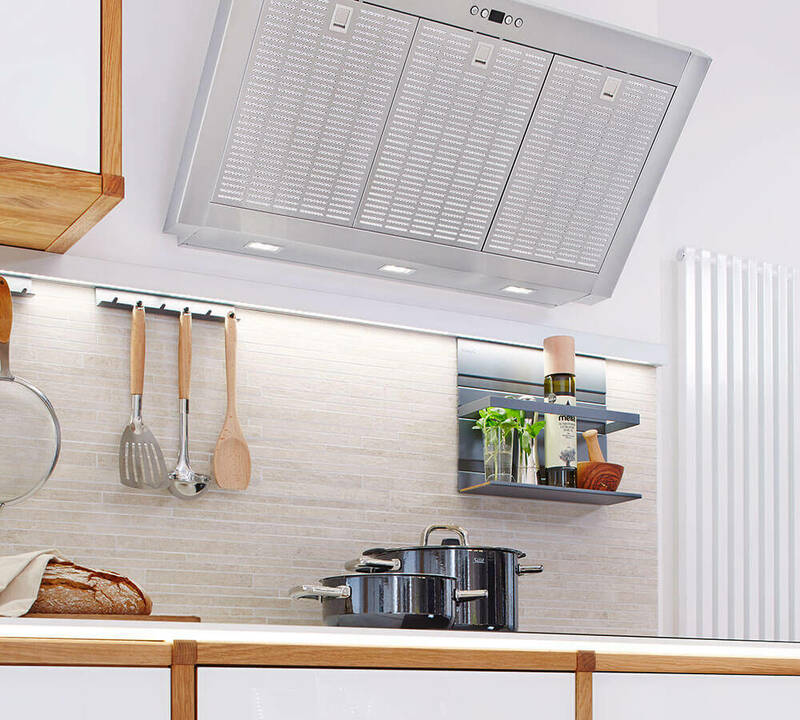 Along with their central function – cooking – intelligent and up-to-date energy and socket management is more and more important. It’s the only way to cope with the escalating number of electrical appliances. 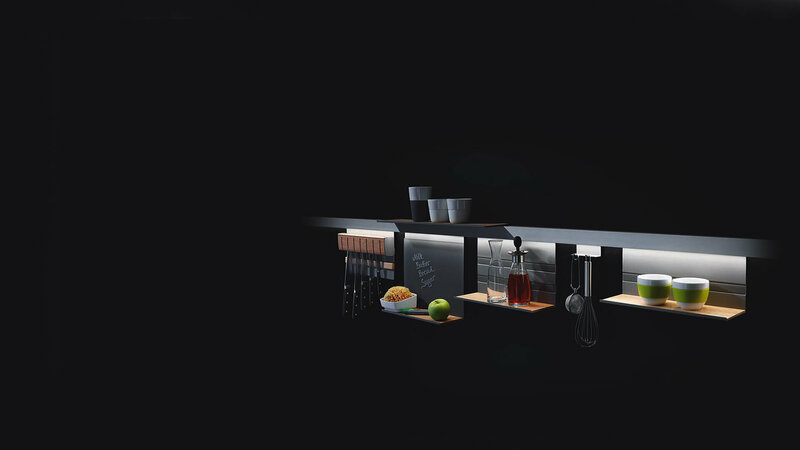 In addition, digital media are moving into the kitchen in a big way. More and more people cook from recipes on their tablets or smartphones. The eBoxx is a practical response to all these demands. 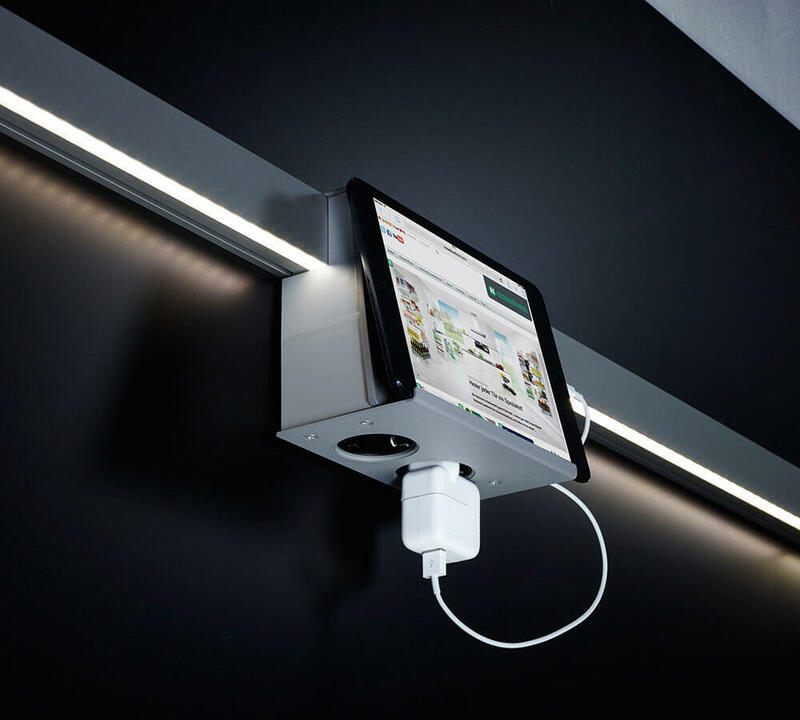 It provides extra sockets – that are easy to reach – and a secure place to stand a tablet or smartphone. 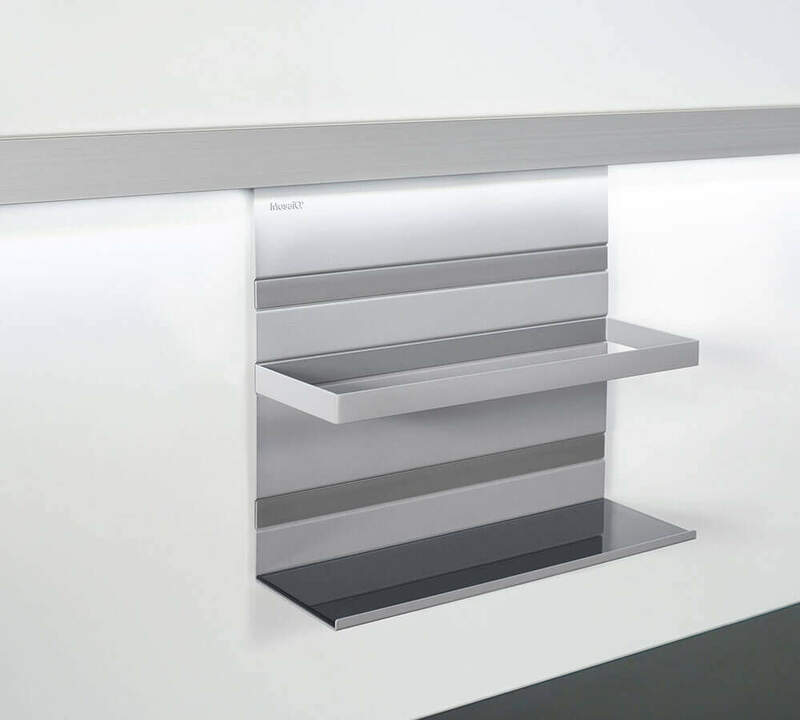 It also locates and conceals LED splashback lighting components that are necessary, but not decorative. 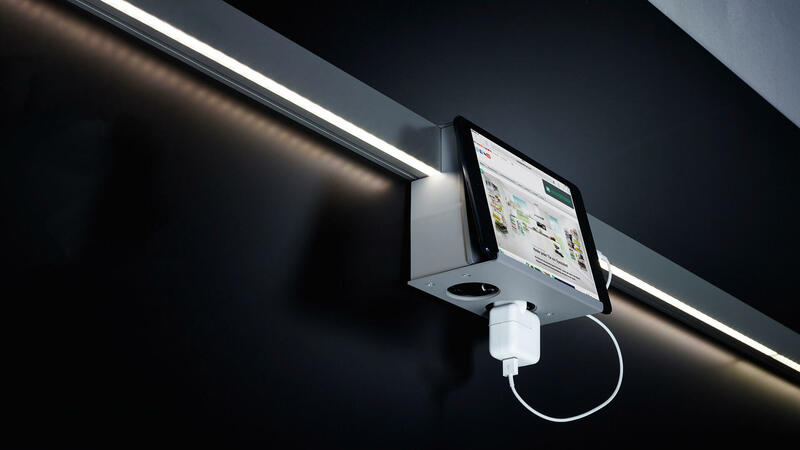 The LED driver, switch and cable are easily stowed out of sight in the eBoxx and the LINERO MosaiQ rail. 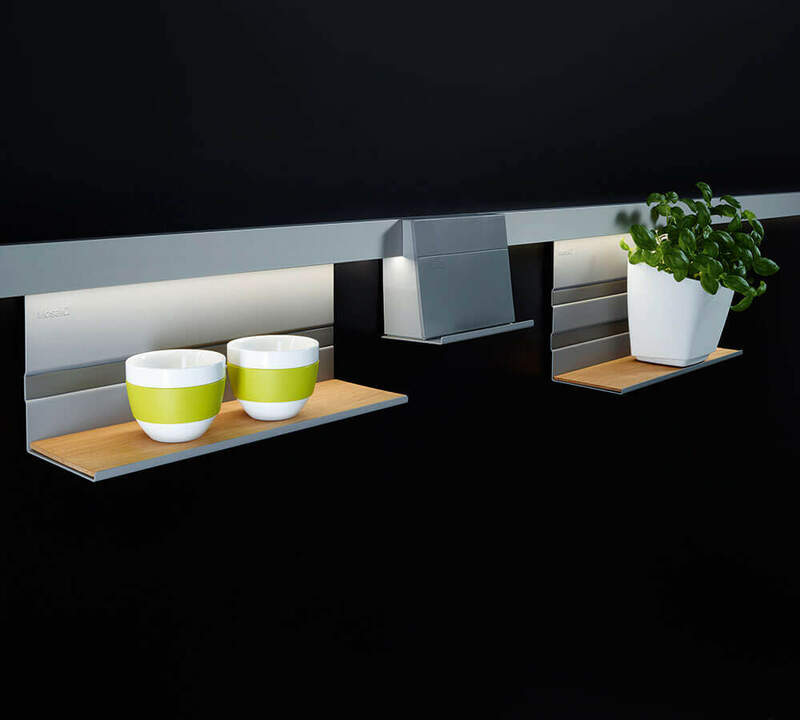 LINERO MosaiQ shelf set: design and create open-plan spaces. 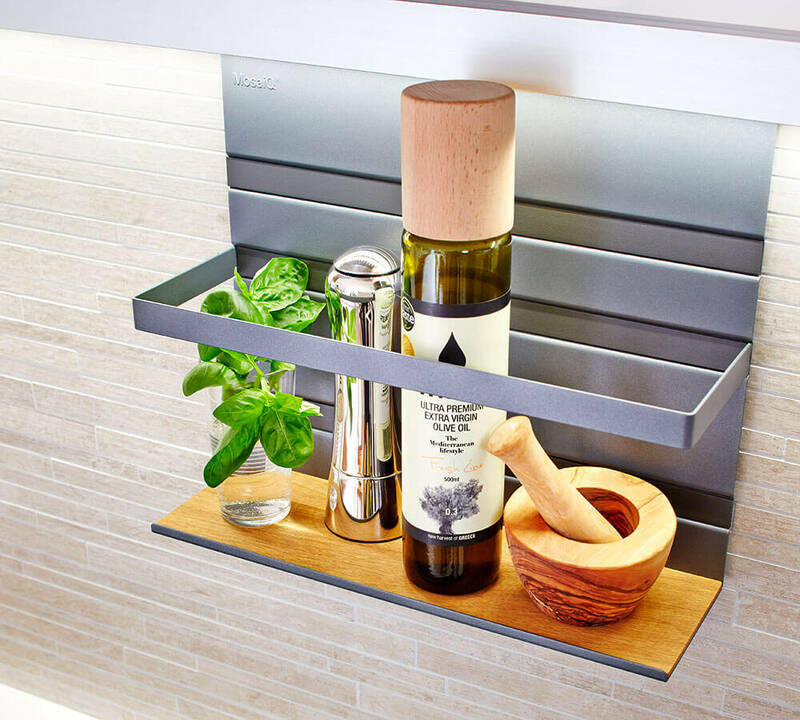 With the LINERO MosaiQ shelf set you can put a shelf exactly where you need it. 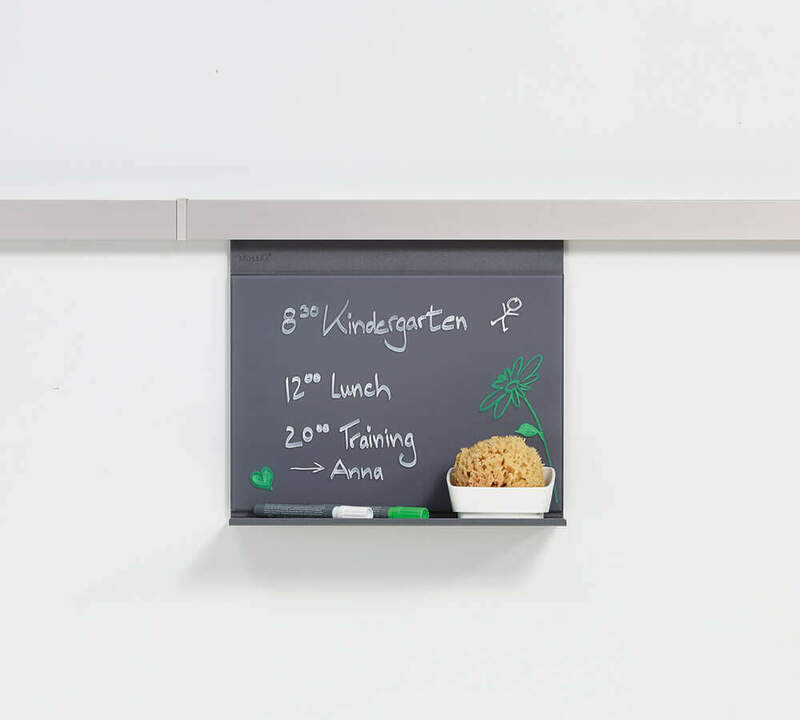 This is a stand-alone organizer element, optically related to the MosaiQ system, that can be put up anywhere. You choose the height (min. 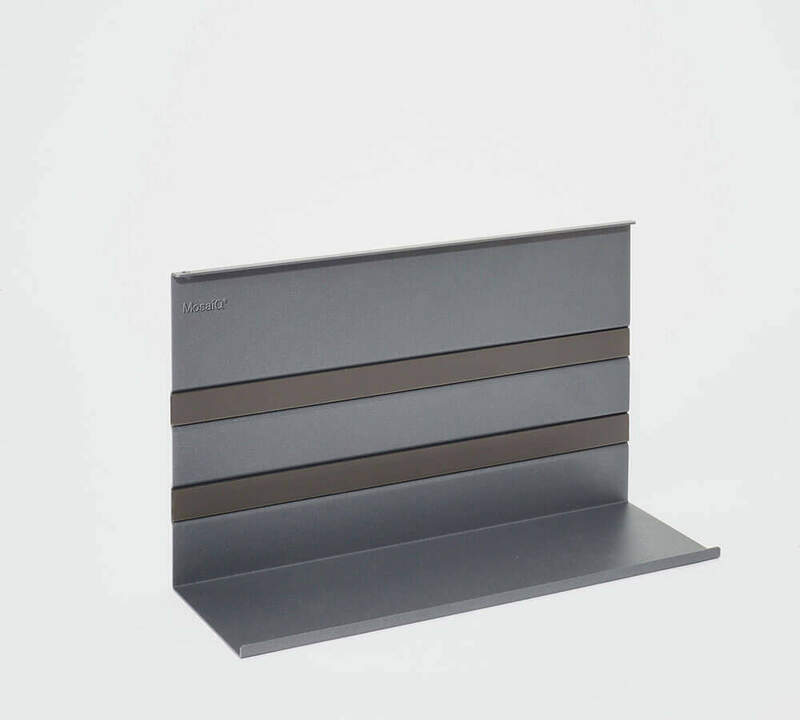 160 mm) and the design of the 16°mm thick back panel. 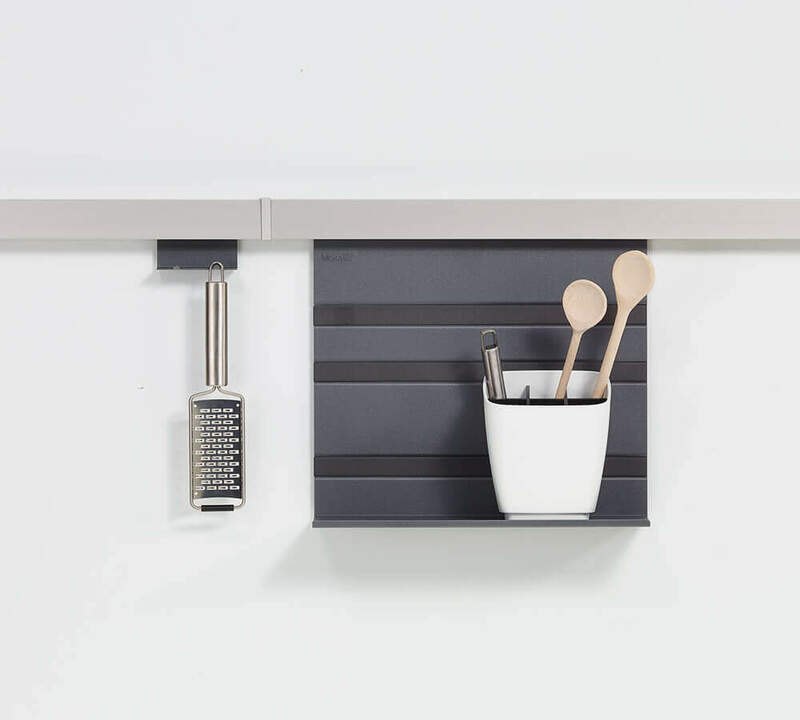 The back panel takes the hanging slots and links the two shelf angles to create a practical piece of furniture. 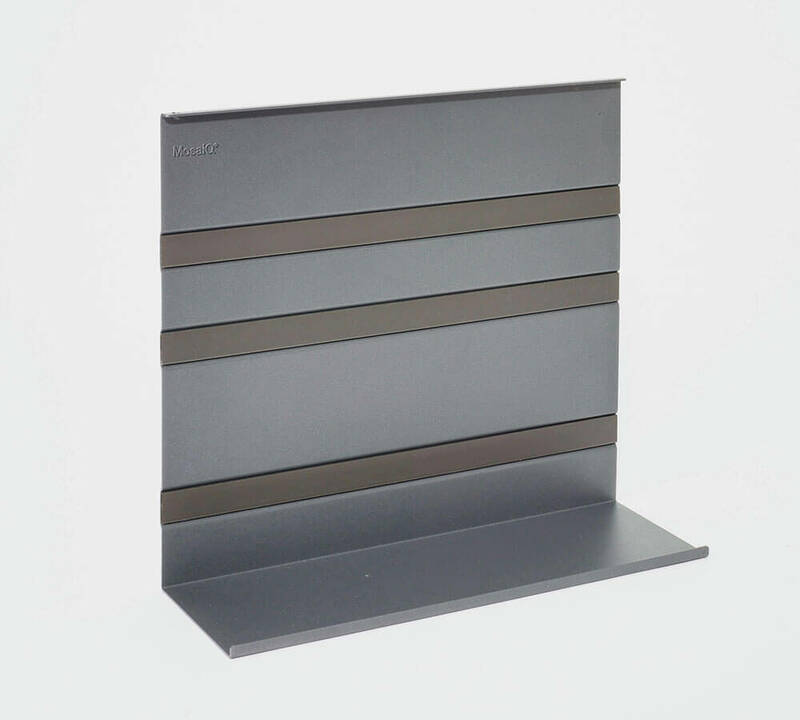 The shelf angles are available in a choice of four widths and in colours that echo the MosaiQ system – titanium grey and graphite black.